Shown above is RW SGC Snopride Jungle Jazz News of Cazpurr. I had lots of fun showing Jungle Jazz! 2017-2018 International Winner Cazpurr Takoda shown below with his trophies. Owned by Monique and Joop De Jongh from Netherlands! 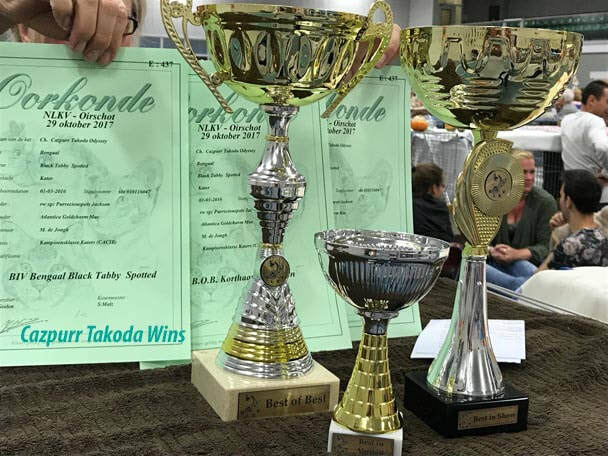 Congrate on Tokoda's 2017 wins. ​RW SGC Cazpurr All That Jazz one of the few Female Supreme's. Shown above. It is not easy to achieve a female supreme in a Stud/Male dominate show world. Jazz is soon to be honored as outstanding queen having five known show kittens achieving at least a grand champion in the show rings. Great Job my special girl! Jazz is 14 years old shown below. I will be breeding her granddaughter "Jazzy" in 2018. 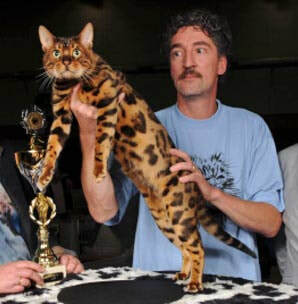 Shown above is Grand champion Cazpurr Jazzman of Bengalislandcat. My special thanks to Donna Haynes for taking the time to show this beautiful boy in the rings. I am so proud of his accomplishments. Jazzman produced a International Winner in 2013 along with many other show achievements. SGC Cazpurr Cowboy Heaven of Texas Star. Great job Stacy Hansen for making Cazpurr Cowboys SGC. This beautiful new 2014 boy running the rings already at 8 months old and is now a Grand Chamapion. Cazpurr Captain Black Caesar of Potts Mountain c/o Judah for short... Owned by Kevin and Jennifer Tingler my dear friends from Virginia. 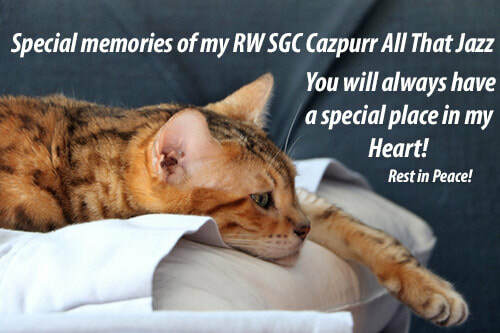 Meet RW QGC Cazpurr Power Play of ToHearts also a Texas favorite! 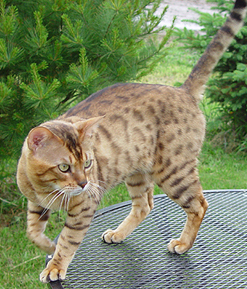 AKA Chilli A Cazpurr All That Jazz Son. He won the honor of being on the logo for the On Safai Cat show in Ohio that year. Congrats Cazpurr Chili. New and up coming show male in 2012. Congrates Terri Payne and Aaron Butler on your beautiful male and thank you so much for the beautiful framed picture you sent to me on Sinbad and his Show Achievements. It brought tears to my eyes to receive it. How very thoughtful you both are. QGC Goldspurr Wildcard of Cazpurr my sweet boy! Gorgeous Aqua eyes. He is now is a loving pet living out the good life. QGC Gateways Blazin Spots of Cazpurr. My very first show titled cat. I am still so very proud of my boy and each and everyone one of my cats. 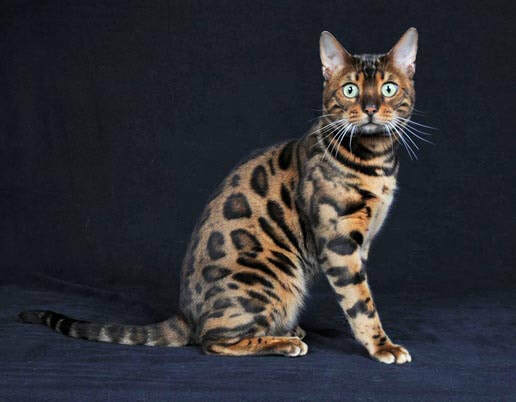 It takes a lot of hard work breeding and showing cats that many people just don't realize. However, I have meet alot of people and have had the honor of meeting some very good friends along the way. These are just a few of the Cazpurr cats that have done well at the TICA and ACFA show rings in the past show years. I will still continue to show but not as often as I have in the past due to HCM and PK Testing and the over-welming prices that it now costs to raise our cats in today's society. 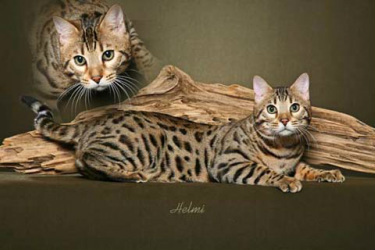 Thank you all for looking and I hope my site will be a nice place to go to look at our beautiful bengals. For more fun with Cat shows- See Our Videos! !